Our annual Sainsbury’s School Games Day kicked off with a bang on Friday 18th May 2018! 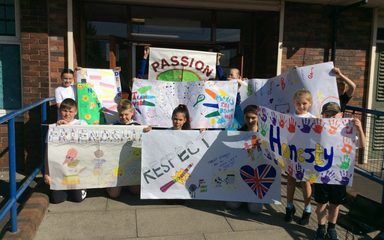 The children in Key Stage 2, 1 and Reception enjoyed participating in a range of activities relating to the Olympic and Paralympic values. The events included: netball, hockey, seated volleyball, basketball, boccia, cricket and blindfold football. Well ill done to everyone who took part! The winning teams will be announced later this week in assembly…who will win the trophy?